Of a winter's morning, the attractions of Standard Quay are not immediately apparent. A chill north-easterly wind slices in across the marshes from the Swale and, beyond, the open sea. The tide is out, and Faversham Creek is mostly mud. The tarred and weatherboarded sheds look deserted. The old wooden boats lying alongside are de-rigged, swaddled in tarpaulin, done sailing 'til spring. Appearances, though, are deceptive. Down at the end of the quay, in a floating dry dock, is the Cambria, a 92ft Thames sailing barge, the last British-registered vessel to carry a commercial cargo solely under sail. Deep in her bowels is Tim Goldsack, a traditional master shipwright. The barge, built in 1906, is being completely restored at a cost of more than £1.4m, partly funded by a big grant from the Heritage Lottery Fund. The project is employing a good half-dozen skilled shipwrights over three years. "At first glance," says Goldsack, "the Quay may not seem an important place. But believe me, it is." But Standard Quay is threatened: the landlord, a developer, has not renewed the leases of the small company that operates it nor of the individual craftsmen who work there. All expire next summer. Amid mounting uncertainty, many here fear that the quay – one of only two in the country with the facilities, and skills, to look after historic wooden boats – will not now survive as a working yard. The last Thames sailing barge ever built, the Lady of the Lea, is moored and maintained here, as are the Lady Daphne and the Greta, which first sailed in the 1890s and was one of the Dunkirk Little Ships: three of the 40-odd Thames sailing barges still in regular sea-going use today, themselves all that are left of more than 2,000 that plied their trade at the turn of the last century. In those days, the long, shallow, flat-bottomed hulls of these classic working boats, topped with their vast expanses of rust-red sail and laden with cargoes ranging from bricks to hay, mud to munitions, grain, garbage and coal, were a common sight from the remotest creek of the Thames estuary right up and round to Britain's north-eastern ports, along the south coast and even across the channel. These days, the remaining few are mostly owned by syndicates and private individuals with deep pockets (once restored, a small Thames barge costs maybe £20,000 a year to run and maintain; a larger one perhaps twice that), or by charitable and educational trusts – like the Cambria – and small commercial charter companies which offer days and weekends on the water. "They're extraordinary craft," says Brian Pain, who has owned Lady of the Lea since 1975. "Working boats, perfectly adapted to their environment, a feature of this coastline since the 1800s. Once you've seen them, sailed in them, you can't help but fall in love. And once you've started work on one, of course, that's it." Twenty-five Thames barges, and a wide array of other traditional craft including oyster smacks and cutters, were built at Standard Quay in its heyday. It is, by its nature, an unadorned, rough-hewn, scruffy sort of place; a working boatyard, not a museum (though it gets plenty of visitors). Boatbuilding, especially this kind, entails creating a fair degree of disorder. It isn't a luxury Thames marina like St Katharine Dock in London. But it is beautiful, and that beauty derives not just from the wide north Kent skies, the sweep of the marshes, the winding creek and the weathered simplicity of its buildings, but also from the fact that Standard Quay today is still doing pretty much exactly what it was built to do, 150 years ago. Just up from the Cambria is the Morayshire, a 1952 Scottish purse seine fishing boat, being brought back from the dead by shipwright Simon Grillet and a brace of apprentices from a pioneering not-for-profit scheme that was set up here last year to train young people in the many (and fast-disappearing) skills of traditional boatbuilding: joinery, metal-working, pattern-making, appropriate engineering, fastenings, rigging, sailing. Knowing your wood, from tree to sea. "There are other places to learn," says Grillet, "but you have to pay – a lot. This is on the job, for local people, in a local trade, one the north Kent coast was famous for. Sites like this are precious. The skills are disappearing, and you simply can't take bigger wooden boats to most boatyards." The clapboard buildings, grade II-listed, weatherproof but with few creature comforts, are places of hard work too; one houses the workshops of Colin Frake, one of only two craftsmen in the country making blocks and pulleys and deck fittings for traditional boats (he did most of the gear for the Cutty Sark a few years back, and has just quoted to supply HMS Victory). "This could," says Frake, 65, "be the home of the Thames sailing barge – moorings, preservation, rebuilding, maintenance." Pain, who runs the company that operates the Quay, adds: "It's a vibrant concern as it is; everyone here's busy. The demand is definitely there: the dry docks have been in solid use since they came here, and they're booked up two years ahead. Twenty people work here at the moment, but it could easily be 50 or 60 – one of the town's biggest employers." Pain's not-for-profit vision, for which he had been promised the chance of funding (and pledges to help secure more) from the EU and British Waterways, as well as a major grant from the Sainsbury Foundation to finance the apprenticeship scheme, was to turn Standard Quay into the south coast's centre for traditional wooden boat maintenance and restoration. "A not-for-profit company would have brought some quite serious money in, there's no doubt," he says. "It's a great scheme. It provides employment, it's a fantastic educational facility, it would attract tourists and give Faversham something truly unique, rooted in its history." Pain's plans are modest: three working drydocks for longer-term work; slipways and blocks to allow barges to be floated out of the water at high tide for shorter maintenance and refits; an open Kentish barn to serve as a sawmill; a workshop for dinghies and other small wooden craft; a sail loft; Frake's workshop; a small museum and visitors centre complete with viewing gallery. Almost everything, he notes, "is here already". It looks unlikely, though, that they will ever be realised. The local council, having spent enough public money on consultants' reports to pretty much secure Standard Quay as a working yard, seems unwilling to contemplate anything as radical as compulsory purchase. And the landlord, Michael White, shows no intention of renewing the lease held by Pain's company, Standard Quay (Faversham) Ltd. Indeed, he successfully brought a court case last year over non-compliance with the existing lease, demanding major improvements to the quayside and buildings and restricting the shipwrights to a six-foot strip of quayside. White insists he wants to keep barges at Standard Quay, but aims mainly to develop it as a "tourist gem" complete with restaurant, wine bar, tearoom, antiques centre and craft exhibitions. He says the quay has been run "in a very poor manner . . . as a hobby to subsidise the mooring and care of the directors' personal vessels", and that the buildings and wharf have been "allowed to fall into disrepair". Pain argues he has put a lot of his own money into Standard Quay, which is in far better condition now than when the lease was signed. At the root of the dispute, as so often, lie two radically different conceptions of what this historic site should be: a difference emblematic, perhaps, of our current disregard for the heritage crafts that make up such an important part of this country's cultural heritage. We preserve buildings; we do nothing, in general, for the hard-learned human skills that, down the centuries, helped make us what we are. Pain, Frake and the barge community say Standard Quay is a proven success as a working shipyard. White's view is that the place is "stagnant", "going nowhere" and "losing money" – as well as being "very messy". A properly run "tourist attraction with barges", he says, will be viable, and he promises he aims to keep a degree of ship repair activity on the site and support the apprenticeship scheme. Those who use Standard Quay believe that even if he means to keep that promise, White does not really know enough about shipyards to be able to do so: boatbuilding, they point out, is noisy and untidy and, basically, incompatible with antique shops and tearooms. White wants barges at Standard Quay, they believe, as a picturesque backdrop to his other activities: the tourist draw. But they doubt barges will come to a sanitised yard, and they question who is going to come to a tearoom here on a bleak Monday afternoon in February? They suspect that what White is ultimately interested in is a bunch of luxury waterside apartments, although he strenuously denies this. The continued uncertainty is slowly killing the yard: the wooden boat community is a small one, owners have to plan repairs and maintenance far in advance, and none of the craftsmen or shipwrights at the quay feel able to take on any new longer-term work. Frake has emptied his workshop and is looking for alternative premises; Grillet says the situation is "a disaster"; for Goldsack it's a "tragedy. I'll have to up sticks and go elsewhere – though I don't know where – if the infrastructure goes." After 17 years at Standard Quay, Pain is disappointed, but refuses to give up hope. He's lobbying the local council. 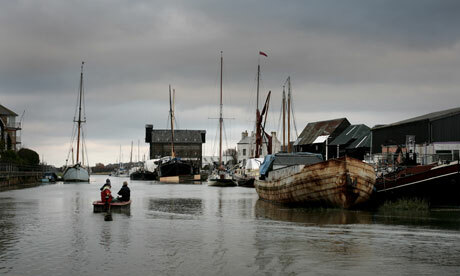 "The quay is at the heart of Faversham," he says, "and it's perfectly suited for its current use. I can't see how anyone can hope to make a significant commercial gain here other than through housing. And any alternative use will require major refurbishment and alteration; the unique spirit of the place will disappear. I love Standard Quay, I love these boats, and I don't want to see these skills disappear."